It really is easy to find stories of animal abuse on the internet, and our aim is never to promote or publish these atrocities. This story is however one of those stories that we felt was not one to publish to create more awareness, but it was one we wish to publish giving our heartfelt apology to this animal and our wishes for him to find peace in his forever lifetime from the acts bestowed upon him days before his demise. We want this sentient being to know that we apologise for this and we wish to keep his memories alive as a form of remembrance and deep sorrow for our doing. Please be warned that the content below is of a graphic nature. Taking on the role as an Animal Rescuer is often traumatising to the core. Yet they continue to fight against the wrong, and they continue to try and make the world a better place, one animal at a time. Please support the warriors of Dassenberg Horse Rescue Centre, located on the outskirts of Cape Town, in Atlantis. 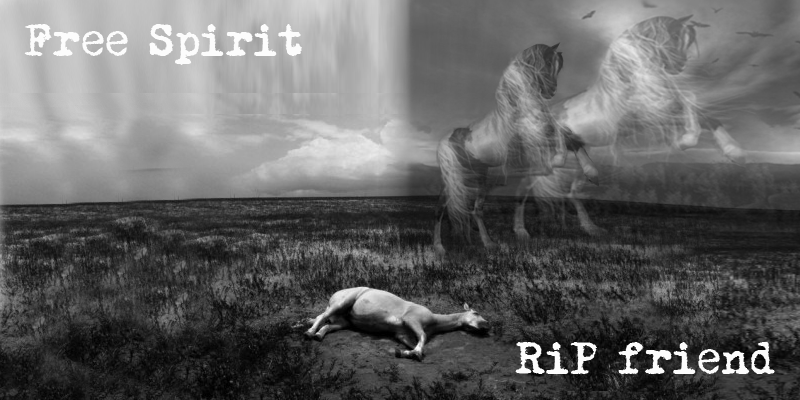 In honour of you Free Spirit, your story will be told and we will never forget you, even though none of us ever met you. This is a true story taken from the files of the Dassenberg Horse Rescue Centre in Klein Dassenberg, Cape Town. To indicate the harshness and abuse that goes on behind the scenes and in backyards of picturesque neighbourhoods….the devastating effects of trauma that play out in a horses life, a lot of them in our sanctuary today and very much what the role of DHRC was in its early years. “Please” said a desperate voice on the other end. “Can you please go to Atlantis? There is a pony there that has been hit by a car and may have a broken leg”. A constable looked up as he heard her footsteps… “Yes?” he asked. “Can I help you?” “Yes” she replied “Do you know about a pony that has had an accident in Atlantis, and where I may find him? I am not too sure of the streets here,” she ended lamely. “Follow us Ms”, said another obliging constable, “we will show you the way, follow our van”. It is here, on the open space…- there” and pointed straight ahead.
. She realized it was no use. “We have to shoot him,” she told the constable. “to put him out of his pain and suffering”. “No!” said the constable. “You can’t shoot him until I get the okay from my Captain.” “You can shoot the horse,” she heard the constable later told her, “on one condition that you immediately remove the carcass”. Her heart wrenched with anguish, she did not have suitable transport so she could not shoot him. How much more pain can he take, she wondered as she knelt on the ground and stroked him gently over his face. “What’s your name little one?” she asked. The name “Free Spirit” entered her mind, and so it was. Fumbling with her phone, she managed to find the welfare number that had called her in the first place and crying uncontrollably, pressed the redial button. As soon as she heard the connection at the other end, she burst into a fresh bucket of tears and stuttering into the mouthpiece, sobbing heart wrenching and gut gnawing sobs, she spluttered. “They won’t let me shoot the horse and he is in such pain and burning up in the hot embers, do something!” The voice on the other side tried to pacify her and said “Calm down lady, who are you and where are you?” She shouted her name into the phone, and told them that their office called me to the pony in Atlantis, to check their records and to stop wasting time. “Okay”, said the voice, “we will get in touch with the Captain at the Atlantis police station right now. Free Spirit opened his eye and looked into hers - he gave a barely audible groan. She looked into the depth of that pain racked eye, feeling absolutely helpless and knew this was something she would never forget in this lifetime. “Okay”, the constable’s voice filtered through from afar, “you can do the job now”. Coming to her senses, she realized the Captain had at long last given permission. As she lay Free Spirits head down as gently as she could, she whispered a prayer. She removed her revolver from her pocket and with a heavy heart she took aim through watery eyes and fired. BANG, the sound of the shot echoed across the forlorn suburb and all that remained was the lifeless body of Free Spirit, still burning in the embers. She knelt down once more, her smoking gun beside her and stroked Free Spirit’s head. She closed her eyes and silently asked St Francis to guide him back home to where he once again could run free over hills and through green lush valleys. After a week of making enquiries, she found out what had actually happened from some of the folk in the town.